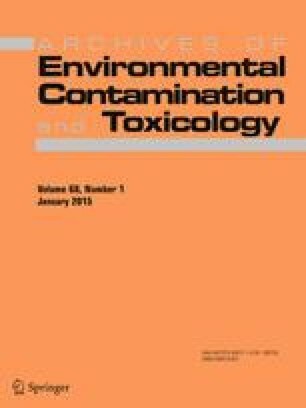 This study focuses on the discussion of different lines of evidence (LoEs) applied to a sediment-quality assessment that considered the following: chemical concentrations of metals; polycyclic aromatic hydrocarbons (PAHs) in estuarine waters, sediments, and oysters (native and caged Crassostrea brasiliana); PAHs in semipermeable membrane devices (SPMDs); simultaneously extracted metals-acid volatile sulfides (SEM-AVS); benthic community assessment (the exploratory benthic index and the relative benthic index); chronic toxicity tests with the sea urchin Lytechinus variegatus; and bioaccumulation models. Significantly contaminated sediments from the Santos Estuarine System and the consequent toxicity of tested organisms were measured. Caged oysters presented bioaccumulation rates ≤2,500 % of total PAH content and 200 % of metal content when compared with control organisms from an uncontaminated area. SPMD results presented the same bioaccumulation pattern as caged oysters but at lower concentrations. Benthic communities presented some alterations, and there was a predominance of tolerant species in the inner part of the estuary. According to the SEM-AVS approach, metals should be assumed to be nonbioavailable, but experiments with transplanted C. brasiliana showed metal bioaccumulation, particularly in the cases of chromium, copper, mercury, and zinc. The weight-of-evidence approach was applied to compare and harmonize LoEs commonly used in sediment-quality assessments and to then classify estuary environments according to both their potential for having adverse effects on the biota and their possible ecological risks. All of the results of these approaches (except for SEM-AVS) were found to complement each other. The authors thank the Brazilian Ministry of Education – Coordenação de Aperfeiçoamento de Pessoal e Ensino Superior (CAPES Grant No. 099/06) and the Spanish Ministry of Education–Ministerio de Educación–Dirección General de Universidades (MECD/DGU No. PHB2005-0100-PC) for the Brazil-Spain International Cooperation Program. The R. J. Torres also thanks the Brazilian National Council for Scientific and Technological Development (CNPq) for a postdoctoral fellowship awarded to conclude this study. D. Abessa, A. Cesar, A. A. Mozeto, and C. D. S. Pereira thank CNPQ for the productivity fellowships awarded. T. A. Del Valls Casillas thanks the Ministry of Economy and Competitivity in Spain for partially funding his participation in this study through contracts CTM2011-28437-C02-02 and CTM2012-36476-C02-01. A special thanks is given to Danielle J. Deremo for the English language review.